BE THE CHANGE is an essential handbook for the modern activist, whether your campaign is big or small, local or global… or somewhere in between. If you want to challenge injustice in your school, workplace or community; if you want to lend your voice – and more – to a charitable cause close to your heart; or if you are inspired to take on a complex issue on a massive scale, Gina Martin’s practical and empowering advice will give you the tools you need to ensure your voice is heard, your actions are noticed and your demands are met. 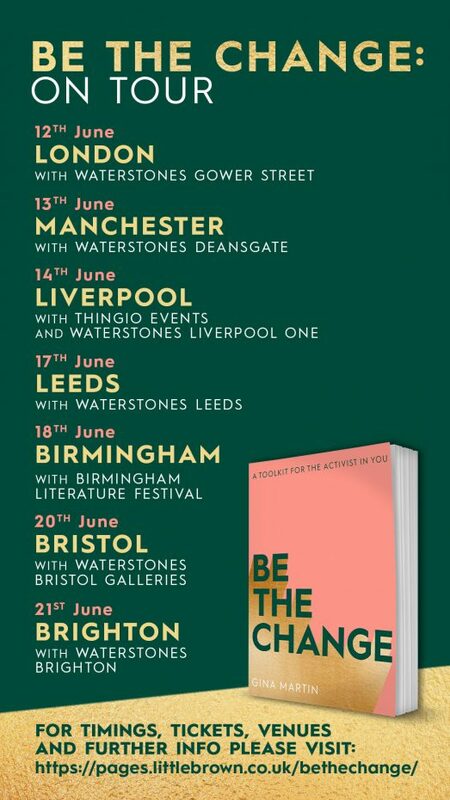 To celebrate publication of her new book, BE THE CHANGE: A TOOLKIT FOR THE ACTIVIST IN YOU, join Gina Martin as she meets with campaigners and activists who are doing incredible things locally, nationally, or even globally. With no prior political experience or legal training, Gina successfully campaigned to make upskirting a criminal offence. The legislation passed its final stage in the House of Lords on 15th January and came into effect on 12th April 2019: taking non-consensual photographs under anyone’s clothes is now illegal in England and Wales. BE THE CHANGE is a comprehensive toolkit for the modern activist to equip us to fight for change – big or small, local or global. It will include practical advice to help the reader to challenge injustice in many forms: whether lending a voice to a cause or taking on a complex issue on a massive scale. This June, Gina will be chatting with individuals who are already doing just that; looking at what action they are taking to effect change in their communities and beyond, and widening the conversation to help and inspire others to do likewise. Take a look at the listings below to see where your nearest event will be. We look forward to seeing you there, and to coming together to be the change we want to see in the world. 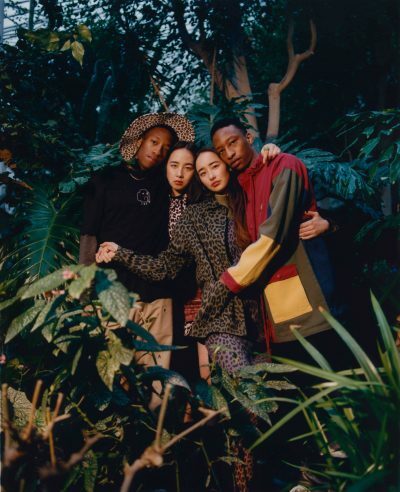 Pre-order BE THE CHANGE to win £250 Lazy Oaf vouchers! Want to win £250 worth of vouchers to spend with the awesome fashion brand Lazy Oaf? We thought so! To enter for the chance to win this great prize, simply pre-order Be The Change by Gina Martin in any format (paperback, eBook or audio) and provide proof of purchase (a screenshot or photo of your receipt), your name and email via the entry form below. Entry is only open to residents of England, Scotland or Wales and you must be 18 years or older. The giveaway closes on Wednesday 12th June at 11:59pm. Don’t forget to read the full terms and conditions below. Good luck! Visit the Lazy Oaf website here. For exclusive previews and news, sign up to the Little, Brown Book Group newsletter. The data controller is Little, Brown Book Publishing Group Limited. I confirm I’ve read and accept the competition Terms & Conditions. 1 This is a prize draw to win a £250 Lazy Oaf voucher. To enter, please pre-order a copy of Be The Change by Gina Martin in any format and upload proof of purchase, such as an order receipt on the giveaway page when you enter the giveaway. 2. The winner will be selected at random from the entries received in accordance with these terms and conditions by a member of Little, Brown Book group, whose decision will be final and no correspondence will be entered into. 4. The prize draw opens at 12:01 am GMT on 17.04.2019 and closes at 11:59 pm GMT on 12.06.2019. Any entries received outside these specified times and dates will not be eligible for entry into the competition. website and on other websites and social media accounts. 6. The prize draw is open to residents of England, Scotland and Wales aged 18 or over except employees of the Company, their families, or anyone professionally connected to the competition either themselves or through their families. 9. The Company reserves the right to alter the prizes or cancel the prize draw without notice but will try to avoid creating any undue disappointment. No cash alternatives to prizes will be provided. If the winner is unable to accept their prize or cannot be contacted within two weeks, the Company reserves the right to select another winner. 11. The Company is the data controller of Personal Data that it collects in the course of running the prize draw and will use the Personal Data in accordance with the Company’s Privacy Notice https://www.littlebrown.co.uk/Information/Privacy.page It will use such Personal Data for the purposes of running the prize draw and delivering any prizes and will delete it after a reasonable period from the end of the prize draw. “Personal Data” means names of entrants and other details provided by them (e.g. email addresses, telephone numbers) for the prize draw. The Company will not share such Personal Data with any third parties except for the purpose of delivering the prizes. The company will need to provide the Winner’s relevant information Lazy Oaf and other third parties to enable the prize to be fulfilled. 12. Where entrants have opted-in to receive communications from the Company, the email addresses of entrants will be used by the Company in accordance with its Privacy Notice https://www.littlebrown.co.uk/Information/Privacy.page to send news about books, products and promotions and to invite entrants to participate in surveys. Entrants will be given the option of opting out in those emails if they don’t want to receive any further communications. 15. This competition is being organised by Little, Brown Book Group Limited of Carmelite House, 50 Victoria Embankment, London EC4Y 0DZ (“Company”).